it was used as a Navigational tool to travel and create with. from which is derived the True value of Pi. Join Jain on this excursion into an ancient mystery, finally revealed. ● NASA admitted that when the original Mooncraft landing occurred, the targeted spot was missed by about 20km? What could have been wrong with the Calculations? NASA subsequently adjusted their traditional mathematical value for Pi (3.141592…) by increasing it in the 3rd decimal by .003! ● Also, an ex-Engineer from NASA, “Smokey” admitted (via email) that when he was making metal cylinders for this same Mooncraft, finished parts just did not fit perfectly, so an adjusted value for Pi was also implemented. At the time, he thought nothing about it, but after reading an internet article called The True Value of Pi, by Jain 108, he made contact. ● What if the True Value of Pi (3.144…) was hidden in the height of the Cheops Pyramid in Gizeh, Egypt? ● Pi is not just the relationship of the Circle to the Square, it embodies a Phi (maths of nature) connection between the area of the circle and its surrounding square. This fact puts Pi in the category of Eternal or Timeless Fixed Design. ● Why did Moses instruct Aaron to build an Altar of Incense based similarly on the Double Unit Cube? Why did Egyptian Pharaohs sit upon thrones that showed geometric lines indicating what is known as the Double Square or Double Unit Cube, whose main diagonal is the Square Root of 5, the critical frequency needed to determine both Phi and Pi? ● What if the geometric proof for the Golden Mean or Phi Proportion (1 : 1.618… the mathematics of Beauty and Nature) shows irrefutably that Phi is Pi, based on a Root 5 Maltese Cross, and that this same proof is the psychic and spiritual emblem for Saint Germain, who wears this Maltese Cross on his Heart, as if to protect this holy information. ● If Pi is simply the Circle-Square Relationship, how important is it to know that the Square Area of the Circle compared to the surrounding Square is in the ratio of 1 : 1.272… which is a Harmonic of the Phi Ratio and the critical height of the Cheops Pyramid. 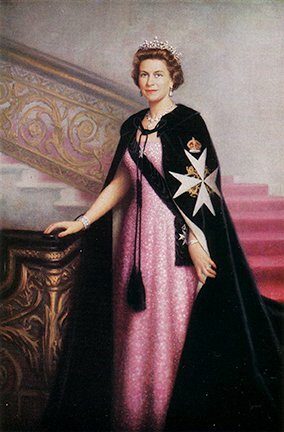 ● Why does HM Queen Mary wear this Maltese Cross on her royal Crown, as pictured at the coronation of King George V1 and Queen Elizabeth, in 1937. ● What if the current Queen of England, her Majesty Queen Elizabeth 2nd wore this Geometric Proof (Root 5 Maltese Cross) upon her royal robe, declaring herself as the Sovereign Head of the Order of St. John and wearing the Insignia of the Order which was made also for Queen Victoria. 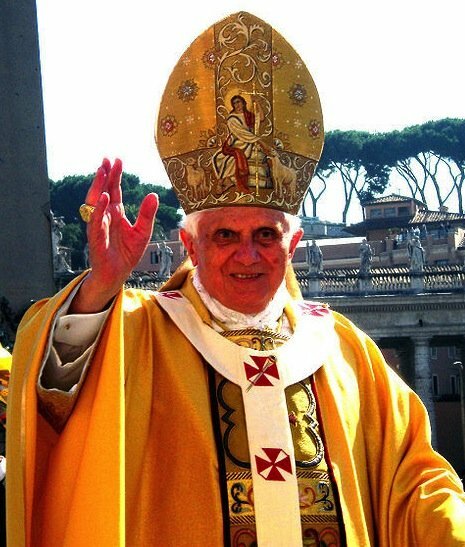 ● Why did Pope Benedictine XVI, and many other holy dignitaries, wear the Maltese Cross on their papal robes and hats? ● What was the Billy Meier Prophesy (born 1937) about, relating that when The True Value of Pi is revealed, the Earth’s frequency will change and will allow a Space Age of advanced Technology to unfold, as in the bending of Time and Space and mastery of the toroidal Physics of Black and White Holes. ● Why was “Plato’s Most Beautiful Triangle” highly revered in his time, and how does it reveal The True Value of Pi? ● What if both an algebraic and a geometric proof existed, both irrefutable evidence that Pi is deliberately deficient, that Pi is a Lie? 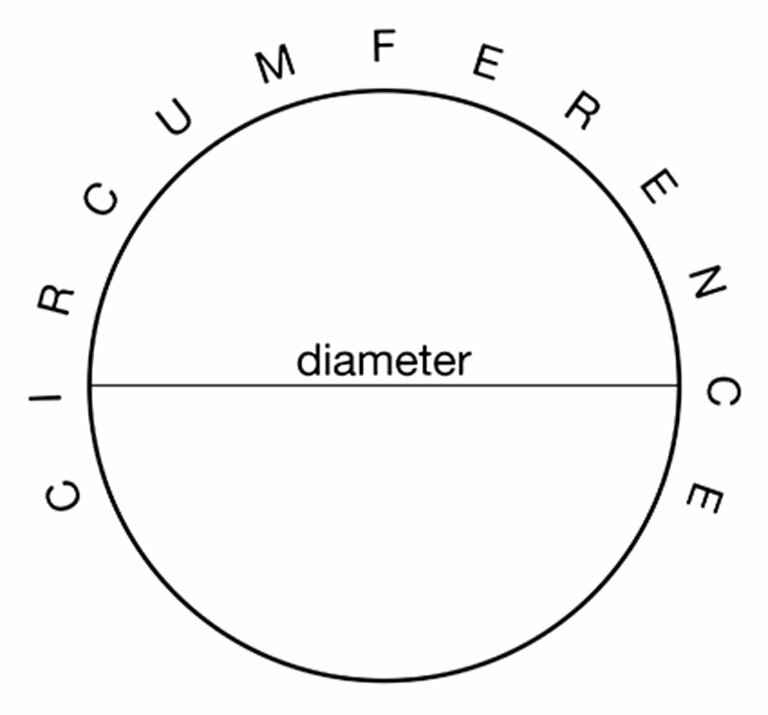 Pi, as you may recall, from your early high school days, is the relationship of the Circle’s Diameter to its Circumference (fig 1). Scholars for thousands of years have enquired, how many times does the known length of the diameter fit into the unknown surrounding curvature. For easier calculations, we set the Diameter as 1 unit of length, and get an approximated value of 3.141…, which means that the diameter fits into its circular periphery 3 times and a bit. For reasons that will be soon explained, traditional Pi is deficient because historically it has awkwardly used logical straight lines to measure illogical curvature. Thus, by using the highest level of mathematics known as Intuitive Maths, the True Value of Pi must be a bit more than anticipated to compensate for the mysterious “Area Under The Curve”. 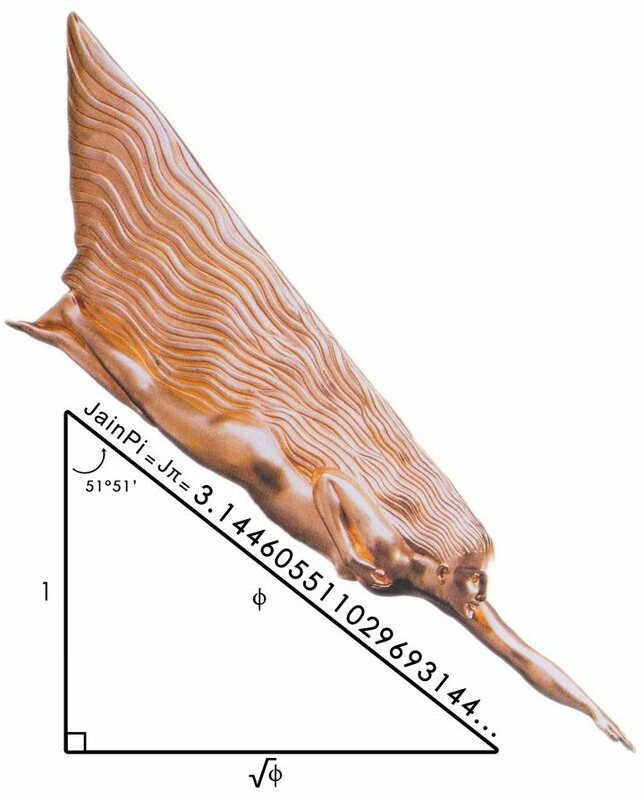 When this is done, the value, currently known as JainPi, = 3.144… can be derived, by knowing the precise Height of the Cheops Pyramid which is based on the Divine Phi Proportion (1.618…). Instead of setting our diameter at 1 unit or 1 square, something magical happens when we set the diameter at the diagonal length of a Double Square = 2.236… which is the Square Root of 5 (meaning 2.236… x 2.236… = 5). This is the critical part of the formula that derives Phi (1+√5)÷2, and was used by ancient vedic seers as their starting point to construct their most important diagram or ‘Yantra’ or power-art called the Sri Yantra. With a Root 5 diameter, the translation of the Phi’s formula into a geometric construct derives the royal Maltese Cross symbol, concluding that Phi is Pi, that Phi generates Pi, and that Pi must be derived with a knowledge of the Harmonics of Phi. When this is understood and utilized, we will collectively enter into a veritable Space Age. 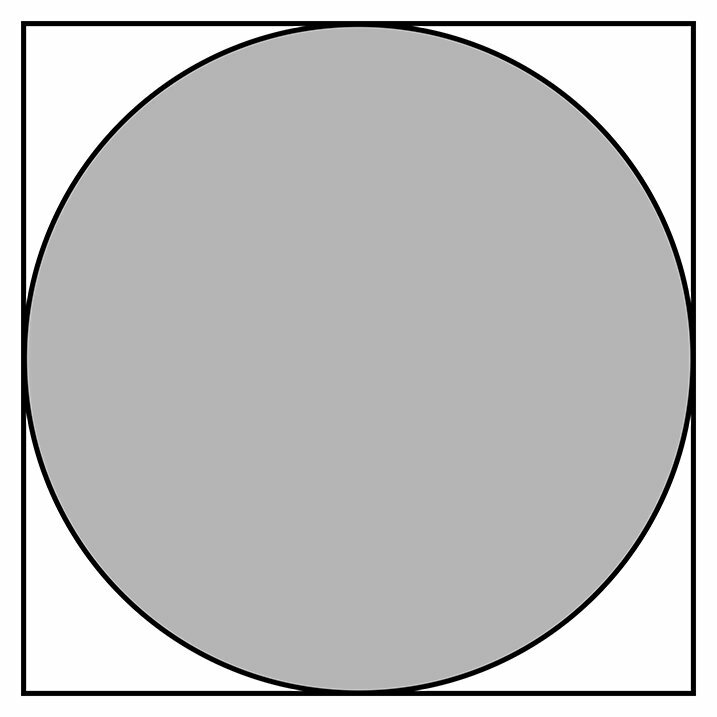 Simply put, Pi is the relationship of the Circle to the Square (Fig 2). 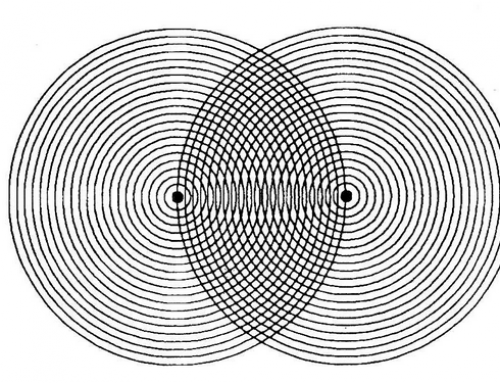 It would be of special interest to learn that the square area of the Circle, when compared to the Square that surrounds it is in a direct Phi harmonic relationship. If the square is 1 unit, then the square area is 1×1 = 1 square unit. The square area of the circle is Pi times the radius squared: π x r2 or πr2 for short, and since the diameter is 1 unit then the radius is half of this making it = ½. Area therefore is π x (½)2 = π÷4 = .786… which is a harmonic of Phi. 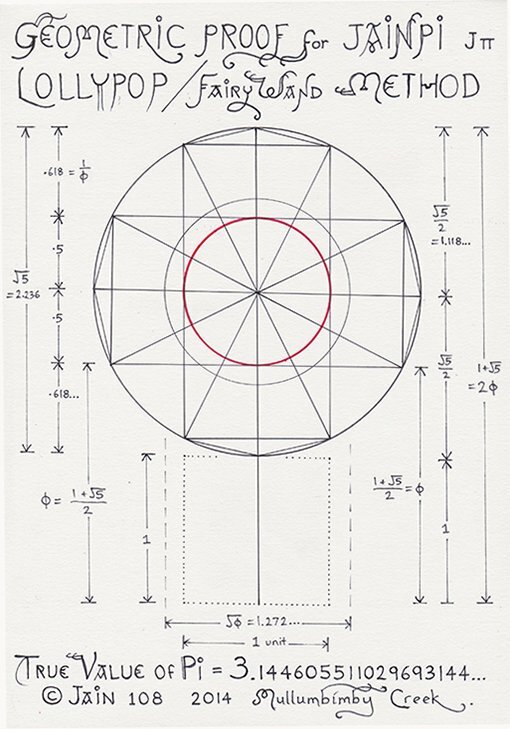 Instead of dividing the area of the circle into the area of the square, we could reverse this and divide the area of the square into the area of the circle and the answer is 1.272… which is the height of the Cheops Pyramid and also the Square Root of Phi, another inverse harmonic of Phi. This critical number is also the only known frequency that can Square The Circle or make the area of the circle equal to the area of the square, which is another way of expressing unification of the Heaven & Earth energies. In all due good respects, we must first honour Archimedes of Syracuse 2,225 years ago, who gave the world his system on how to calculate Pi, approximated to 22÷7, by cutting the circle into say 16 slices of a pizza, and measuring the 16 edge lengths of these 16 triangular polygons (fig 3), to get a good estimate for the circumference of a circle. The idea was that if we kept making the slices of pizza smaller and smaller, by subsequently cutting the circle into 32 slices, then 64, then 128 then 256 slices, we would get a better and more accurate representation for the circumference. The Fundamental Flawed Logic or Error with Archimede’s Increasing Polygon Method was that he failed to measure The Area Under The Curve. In fact, he assumed that The Area Under The Curve, just magically disappeared. Even in his time, Archimedes admitted that his value was a mere estimate! Today, mathematicians would call these billions of straight lines The Limit, and is an integral part of modern day Calculus, that measures Areas Under The Curve, like the path of a cannon ball. Incidentally, our history of mathematics has a military inheritance and background, how to make the cannon ball fly further. Archimedes, our friend, designed weapons of war such as catapults, levers and “burning mirrors” to keep the Romans at bay. In the realm of physics he is best known for his discovery of buoyancy in hydrostatics, leaping from his bath and running naked down the street shouting “Eureka”. Ok, lets give more credit to Archimedes and give him a green tick to say that yes, the value of 3.1415… is a good approximation for pi, but it is only an approximation, his logic for that time was commendable, considering that they did not have calculators or computers, so we can say that his Pi is the Limit of Infinite Straight Lines, but does not account for the Area Under The Curve. It has always bothered me, since high school, that we use straight lines to measure a curved circle. When the True Value of Pi is globally recognized, new advances in Time Travel will be developed as the mathematical harmonic for the Circle-Square relationship will have been rectified correctly to infinite decimal places (fig 4). At this moment, year 2014, traditional pi (aka Legacy Pi or Deficient Pi) is in error in the 3rd decimal place. This prediction has already been made! by Billy Meier (born in 1937) and is the most controversial case in the UFO community. Billy Meier is a Swiss farmer in contact with Plearjen people (humans like you and me) since the age of 6. “In the process they will discover that the base for pi was miscalculated. By eliminating the error in pi, and correcting future computations based on pi, scientists and their amazing, highly developed technology will have the capability to make unimaginable energies accessible to the people of Earth”. We all love our mobile phones and the intelligent technology associated with it, though we suspect that something is just not right, that overuse of contact with these invisible micro-waves can fry our brain and cause cancers. In this analogy, JainPi is the new incoming frequency that will override or correct the current disharmonic application of traditional Pi. This correction or fine-tuning of True Pi’s Circle-Square relationshift will take humanity through the Eye of the Sun, non-destructive access to the higher physics and worlds. Though, it comes with a great caution and a question: Are we emotionally mature to journey to new frontiers through Time & Space? How responsible are we if we are seeking higher worlds and technologies, yet we are destroying and polluting this world, still emptying our sewerage into the pristine oceans! Any invention is only as good as the Consciousness of the Inventor. In the same way that the pyramids Amplify energy, if your Intent is not Pure or if your emotional body is out of whack, the ill-user will only amplify more greed, control, revenge, hate, anger and sickness. Though if you have love, the love will be amplified. This is why this Knowledge of 3.144ology is guarded; if it were an Entity, it would be waiting to meet the right person at the right time for the right reason. 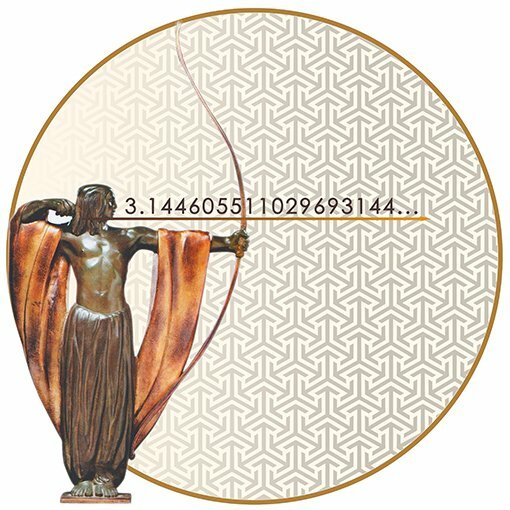 This is suggested and shown on the front cover of the book: “THE BOOK OF PHI, volume 8: sub-titled: The True Value of Pi, JainPi = Jπ = 4÷√ϕ = 3.144… ” where the cosmic archer has the numbers lined up and available on his Arrow, but he has not released the numbers yet to Humanity (fig 5); though soon, after True Pi is vilified, it will be adored, then accepted as common knowledge. The only thing in the way is the pride and arrogance of mathematicians who cannot conceive of such a notion that Pi could be anything else than what their books have instructed them to believe. 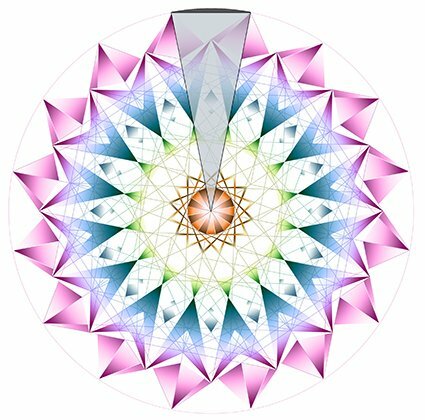 It is their lack of understanding of Fractal Harmonics (based on the cascading proportions of the Fibonacci Sequence) which hinders them to comprehend the elegance of the geometric solution known as the Fairywand Method identical to Saint Germain’s Maltese Cross. Fractal Harmonics allows us to zoom forever into the Area Under The Curve and detect more infinitesimal Areas Under The Curve, concluding that old Pi is only an approximation, a limit of millions or billions of straight lines, that it is deficient, that the True Value of Pi must be a fraction more than we estimated, and that it must be based on Phi, The Golden Mean Harmonics. Thus 4 divided by the Square Root of Phi (1.272…) gives the correct frequency of 3.144… its really very simple. True Pi is like a crystalline seal or a Recoding ready to unlock, to override the old genetic imprint of degeneration, of lack and sickness. It will, in effect, spark a Process of Purification. 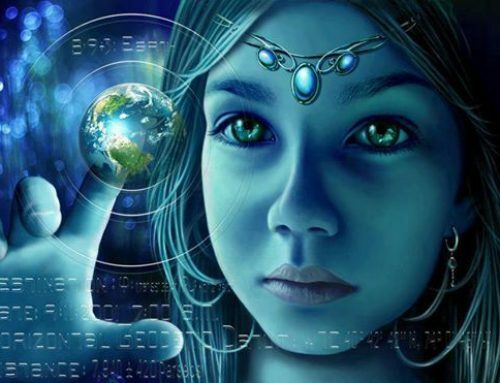 Simply, there is a New Frequency (Fig 6) changing the face of this planet and entering the consciousness of all people. Things are getting corrected and a process of purification must take place for changes to come into effect. 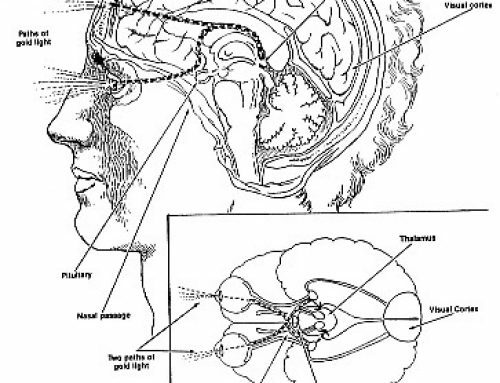 The correction of Old Pi, or Legacy Pi or Traditional Pi is part of this necessary brain-like surgery taking place, but rather than the removal of something, the operation is a Light Implant. Yet the real Key that opens the Door is the secret dimensions of the Cheops Pyramid in Gizeh, Egypt. 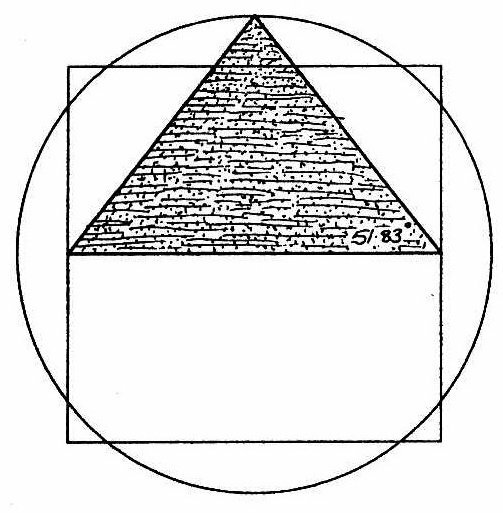 It is the relationship of the 4 sides of the Pyramid’s base divided by the height that gives this value of 3.144… (The 3 dots “…” indicates that this number keeps on going forever, without any detectable repetition). Mathematically, the True Value of Pi is written as: JainPi = Jπ = 4÷√ϕ. JainPi to 50 decimal places (dp) is: = 3.14460551102969314427823434337183571809248823135089… notice how the first 4 digits “3144” repeat at the 15 dp. This secret Harmonic of Sri 3144 could be considered as a Pin Number for the Universe. Let the distance from the centre of the square base to the midpoint of the side be 1 unit (Fig 7). This is called the Apothem. This means that the perimeter of the square base is 2 x 4 = 8 units). 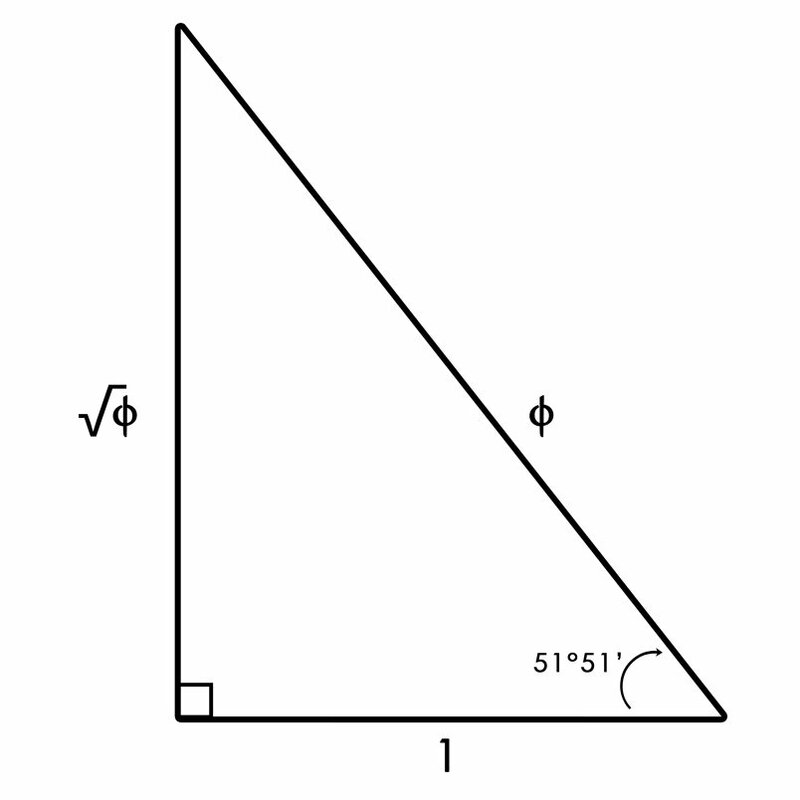 The slope height of the pyramid, not the edge slope, is 1.618… or Phi. When you know 2 sides of a right-angle triangle, you apply Pythagoras’ Theorem and we can determine the height of the pyramid to be 1.272… which is the Square Root of Phi. 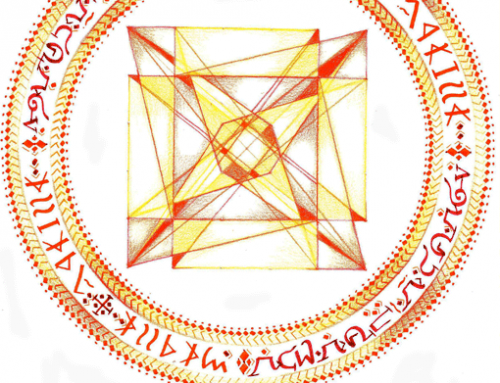 In the world of Sacred Phiometry, this is the most special triangle linked to Fractal Harmonics. It was revered in ancient times. Pythagoras (circa BC500) had a main disciple circa BC300 by the name of Plato who ran an Academy. 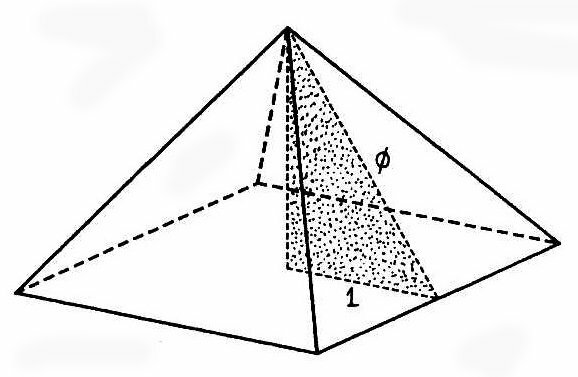 They understood that the x-ray vision of the internal geometries of this Cheop’s Pyramid was based on this important triangulation. It was therefore known as “Plato’s Most Beautiful Triangle” (fig 8), cleverly hidden inside the Cheop’s pyramid, having an Apothem of 1 unit, giving a slope height of Phi or 1.618… and giving the height of the pyramid as 1.272… or the Square Root of Phi, meaning, what number multiplied by itself will give 1.618033988…. This number “1.272…” appears in our attempts to Square the Circle (Fig 9) meaning, if we have a square whose diameter is 1 unit, how much would we have to increase this diameter to create a Circle whose Circumference is equal to the Perimeter of this Square. My main proof for the True Value of Pi as 3.144… is an algebraic proof based on the Mystical Squaring of the Circle (Fig 9), but for this essay it is easier to give an equally important geometric proof. Many readers shut down when they hear the word “Algebra” even though it is a Star Language; it is safer and more illuminating to teach via the visual realm of Geometry, the feminine right-cortex of the brain. Before I introduce the main geometric proof, called The Fairywand Method, I have to introduce another infinitely non-ending irrational number, another seemingly scary square root entity by the name of “The Square Root of 5” (fig 11) absolutely critical to understanding the True Value of Pi and the basis of the upcoming Fairywand Method. Root 5 is part of the anointed Phi Formula (as shown in Fig 10). Root 5 (= 2.236…) is merely the diagonal of a rectangle having proportions 1×2. It is better to visualize this is a Double Square or Double Unit Cube. To know the length of the diagonal of the Double Square (Fig 11) we need to know the length of the two other sides, which are 1 unit and 2 units, and they must be in a 90 degree relationship. Calculating, 12 + 22 = we arrive at Root 5 (or √5 = 2.236…) for the diagonal. This value of Root 5 is the essential part of the Phi Formula (Fig 10) and therefore for the True Value of Pi. 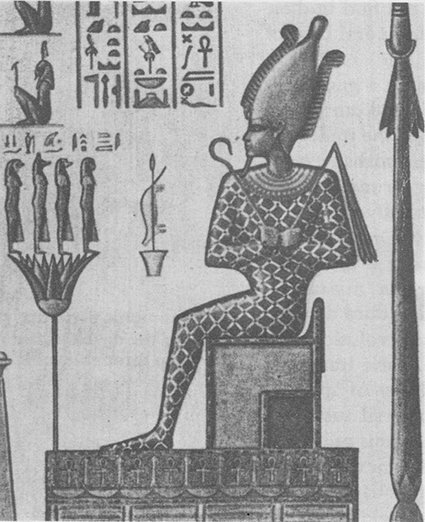 Seen here (Fig 12) is the Pharaoh Osiris seated upon a Double Square as if it is a statement that this Root 5-ness is secret and royal knowledge necessary to be guarded. 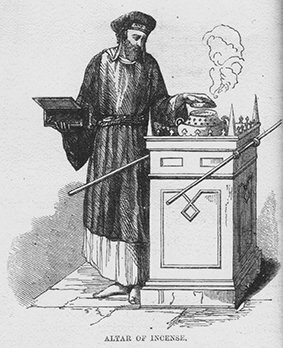 Another representation of Root 5 comes from Exodus Chap 30, in the Christian bible, where Moses instructs Aaron to build an Altar of Incense based on the measurements of 1 cubit by 2 cubit (Fig 13) which is a Double Cube. We first need to visualize a 1×1 or Unit Square in the middle section of a full circle whose diameter is Root 5 (see Figs 14 & 15), which gives us a reference point, allowing us to construct many Double Squares. This central Unit Square can also slide up and down to form a Double Square, it can also slide left and right to form another Double Square. Ultimately we will spin these infinitely possible Double Squares, like a roulette wheel, to make the unexpected Circle Of Pi. Have a look at the slanting diagonal AD in Fig 11, and visualize it now slightly rotated to the left, so that it stands vertical. It means that the upright diameter of our circle is The Square Root of 5 (Fig 11). The Fairywand Method (Figs 14 & 15) is merely the geometric interpretation of the Phi Formulae (1+ √5)÷2. We know the length of Root 5, which is the vertical diameter of the circle; we add 1 unit to this (which becomes the Handle of the Fairywand), giving us a combined length of (1+ √5). Now, the Phi Formula has a Division by Two (÷2) which is really the midpoint of this length. 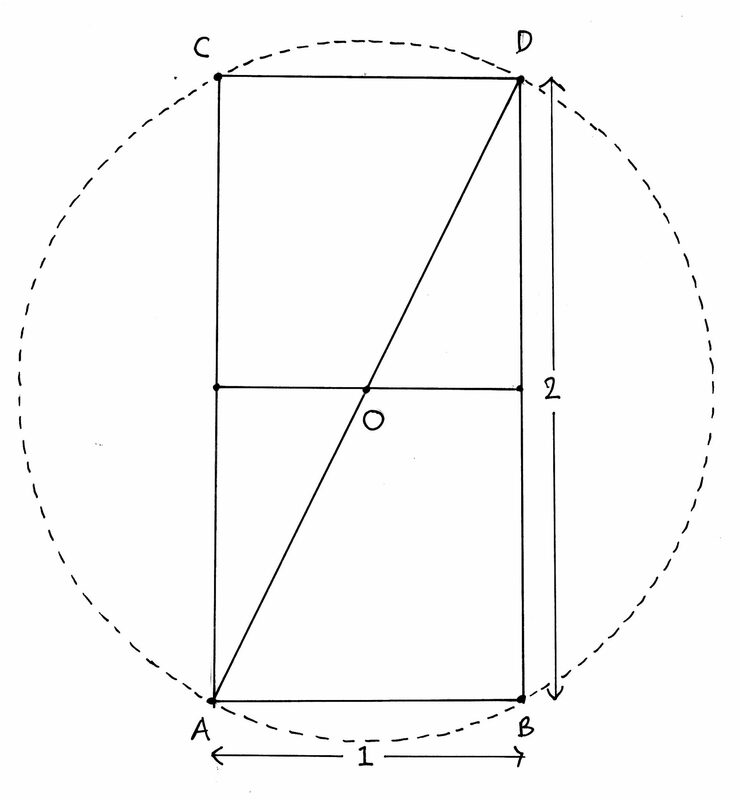 It turns out that the required midpoint, to complete the geometric translation of Phi, becomes a point on the Circle of Pi (shown as a red circle inside the original Unit Square that began all this geometry). It means that if we spun the double square around its centrepoint, like a roulette wheel and kept taking the millions of midpoints required, it would create the red circle within the central Unit Square. All measurements in Fig 14 are Harmonics or Sub-Harmonics of Phi, and involve the entity of Root 5. If we used a diameter other than Root 5, none of the geometric magic could occur. It’s a finely tuned instrument or tool. I believe that this central or Inner Circle of Pi, this hi-tech device was designed to spin, like a wheel and was once used for star navigation. Actually, ancient Egyptian records show that the Pharaohs used a Maltese Cross-like device specifically for Navigation purposes, both for Land and for the Stars. 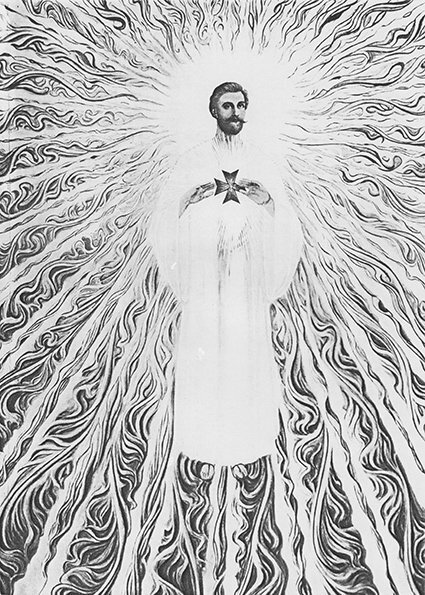 Whether or not you believe in ArchAngels or Arc-Angles, the question remains to be asked, why did this Maltese Cross get selected specifically for Royalty and also for Archangelic use, as typically seen on either the heart or above the head of Saint Germain, an Ascended Master aka The Comte de Saint Germain (Figs 16a & 16b). 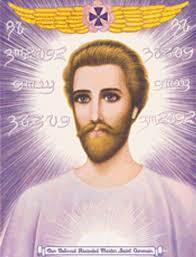 And hidden in the hills of the Hymalayas is “Saint Germain’s Etheric Retreat of the Maltese Cross”! It must be stressed that this Maltese Cross is not a Circle divided into 8 equally spaced points, but rather tuned precisely to Root 5.
c) – an Inner Unit Circle that fits inside the original Unit Square of 1×1 (shown here as a red circle). Of particular interest is this Red Circle within the Unit Square of the Maltese Cross. It is seen clearly on Queen Elizabeth 2nd royal garment, a portrait done in 1968 (Fig 17). Her Majesty is shown in the robes of the Sovereign Head of the Order of St. John and wearing the Insignia of the Order which were made for Queen Victoria (portrait painted by Mr. Leonard Boden in 1968). The question that needs to be asked, is why would the most powerful woman in our current world, adopt or use the symbol of the Maltese Cross? Is it because it captures the coveted frequency of the True Value of Pi? It sets the Royalty apart from the muggles living in a disharmonic reality, and thus gives them a certain power of rulership. That is why education of the masses is important for real global change, for people to realize that a symbol only means what it is programmed to mean and is potentized by mathematical precision, and if enough people focus their Pure Intent for Unity and Equity, then thy Will will be done. Here are 3 more images highlighting the association of the Maltese Cross (True Value of Pi) to royalty. – Fig 18a shows Pope Benedictine XV1 wearing the Maltese Cross on a chest sash over his ecclesiastical robe. 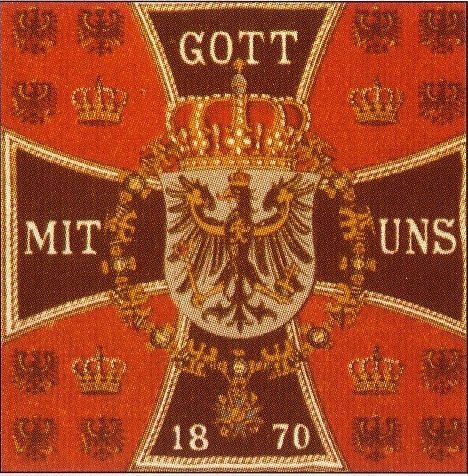 – Fig 18b shows a Prussian cross with a central golden circle in the correct placement that is symbolic of the True Value of Pi. 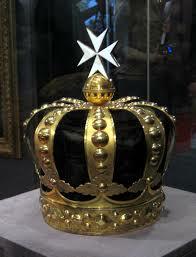 – Fig 18c shows a typical royal golden crown surmounted by a proud white Maltese Cross. It sits above a sphere which is symbolic of the world indicating its supremacy over world matters. Jain is an international lecturer on Sacred Geometry and Vedic Mathematics. 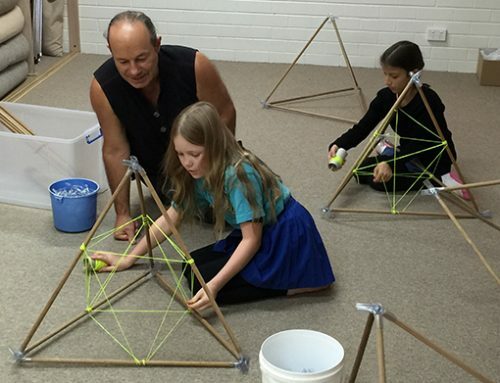 He has taught thousands of adults and children all over Australia in his program called Mathemagics that teaches the translation of Number Sequences into Atomic Art.His main book “Art of Number” is a comprehensive summary of all the rare da-Vinci-code-like patterns and sequences that are currently being uploaded to be made available as a global Online Curriculum, the beginnings of a Sacred Geometry University. His revelation into the True Value of Pi was a result of 30 years of avid investigation into the Phi Mysteries, and comes as a timely Gift to Humanity. This rare book, The BOOK OF PHI, volume 8, is available now. – 13 Bullets of Fact. – Definition of Pi: The Circle-Square complex is simply a Phi (maths of nature) relationship. – The Fundamental Error with Archimede’s Increasing Polygon Method. – What happened to the Area Under The Curve. – Billy Meier Prophecy, that Pi was miscalculated, and when corrected, we collectively steer towards a Space Age. – True Pi and the Purpose of Pure Intent. – Cheop’s Pyramid, 4 sides divided by the Height of 1.272… gives 3.144… True Value of Pi is written as: JainPi = Jπ = 4÷√ϕ. – A basic understanding of Pythagoras’ Theorem is needed. – “Plato’s Most Beautiful Triangle”. – “The Square Root of Phi” (√ϕ) & “The Square Root of 5” (√5). – The Correct Maltese Cross has curved ends. – The Double Square and The Double Cube as seen in the Seat of Osiris and Moses’ Altar of Incense. – The Fairywand Method: the geometric interpretation of the Phi Formulae: (1+√5)÷2 is an irrefutable proof. Essentially proving that Phi is Pi. – Maltese Cross as a dominant symbol for the Queen, the Pope and most Royalties, and used by the Egyptian seers as an ancient high-tech Navigation Device. nb: The Pentacle or 5-Pointed Star has 5 Golden Triangles or triangular emanations. 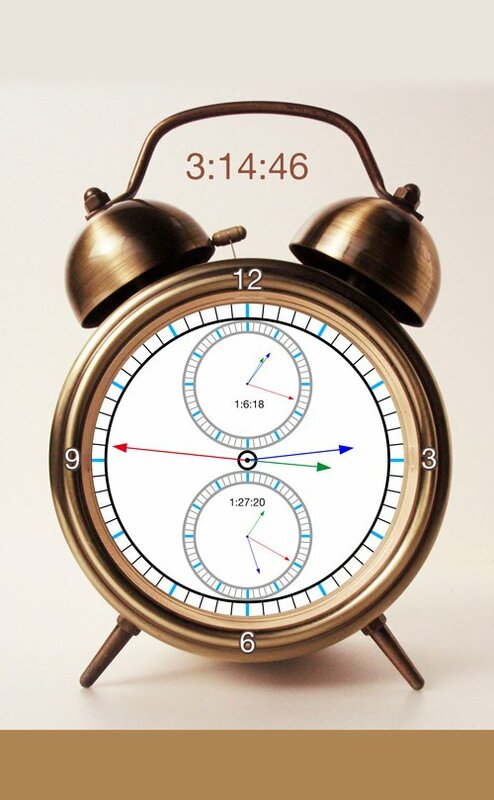 The top inner circle has the cosmic Time of: 1:6:18 which means 1 hr / 6 mins / 18 secs. The bottom inner circle has the cosmic Time of: 1:27:20 which means 1 hr / 27 mins / 20 secs. The ancient Mathematics masters have always known that the two most important transcendental numbers Pi and Phi are intimately related. As shown on this website, The Book of Phi, volumes 1 and 2 are available, but the upcoming, unpublished volumes of 3 and 4 will reveal this Pi Phi Connection and how 3.144… is derived from the Square Root of Phi (1.272… “√ϕ”). These two books, THE BOOK OF PHI volumes 3 and 4 are based on the 24 Repeating Pattern of the Digitally Compressed Fibonacci Sequence that encodes the Frequency of 108, that anointed Vedic Number sonically encrypted in the prayers for enlightenment known as the Gayatri Mantra (having 24 syllables and a sanskrit alpha-numeric gematria of 108). These two books will be released with a companion dvd that will help fully explain this rare information. Visualize a Hexagon in the Circle which has 6 straight lined chords. The relationship of one of these chords to the corresponding curve of the circle, is the issue at hand, and under attack. Fractal Mathematics and Nano-Technology shows that there is always an Area Under The Curve, so no matter how many times we subdivide the circle into smaller and smaller polygons, we only ever reach the limit of the circle. So yes, we can give a green tick to the “Limit of the Circle” as equalling the traditional value of Pi as 3.141592… but this does not account for the infinitesmal area under the curve that just does not disappear, forcing us to conclude that the true value of Pi must be a fraction more that what we thought it was, a microscopic more than we anticipated. This is why NASA are using a secret value of Pi that is a fraction more than the traditional value of pi. It is encoded in the mathematics of the Cheops Pyramid. 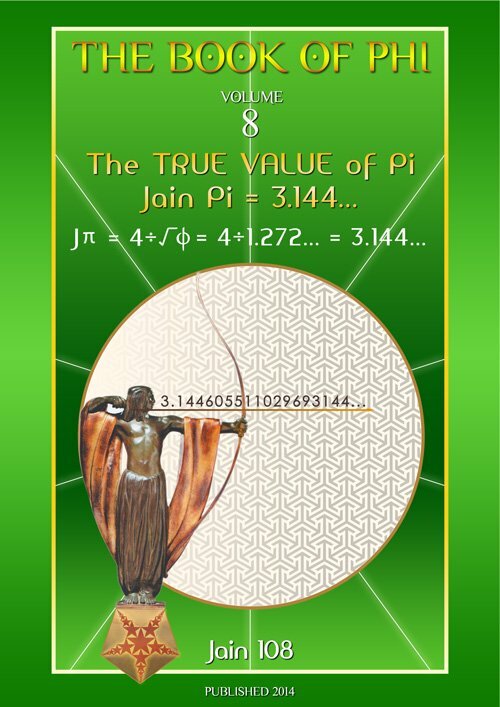 Jain Of Oz’s book on the True Value of Pi shakes the whole foundation of Western Mathematics. In fact, all the Mathematics books have to be rewritten, even related areas like that of radian measure and Euler’s Identity. What will happen now is that the top Mathematicians from the West will be invited to meet the top Mathematicians from the East. An International Conference or Forum is brewing, to determine the final and eternal Truth of Pi that the Ancients knew. The slice of Pi that we have been served is off and disharmonic. Also, to the dismay of all the Circle-Squarers, we have been told incorrectly for thousands of years that You Can Not Equate the Square’s Circumference to the Circle’s Circumference, nor Equate the Area of a Circle to the Area of a Square, ie: The Mystical Squaring of the Circle. But now, believe that it can be done. Ignore all the bad press on Pi and Phi. I (Jain) have been waiting for 30 years for this material to emerge. Intuitively knowing all these years that Pi was miscalculated, that was why I had never written about for 30 years, as I was switched off by the error. I therefore had focussed my whole attention on the Phi Ratio (1:1.618033… the mathematics of where the elbow bends in proportion to the length of the whole arm etc). Soon, I will be releasing the new maths that has emerged linking the relationship of Pi and Phi. 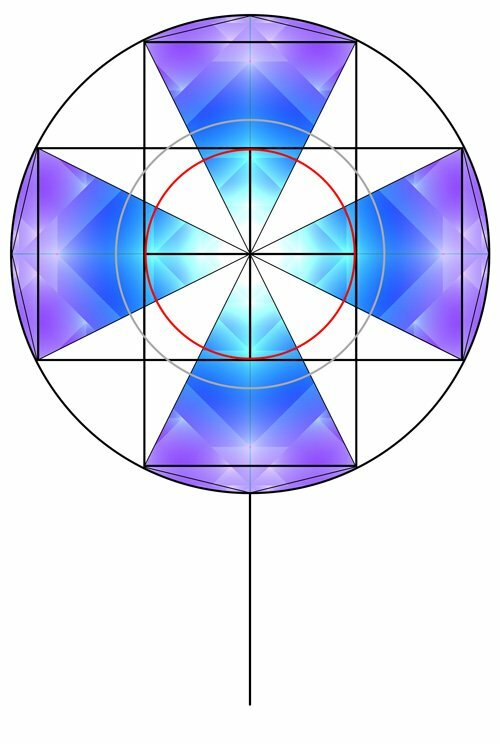 As most scholars know, the only 3-Dimensional symbol that contains Pi and Phi is the Cheops Pyramid of Egypt, that really is the invisible sacred geometry of Light. Stay tuned for an article on this most controversial issue that challenges the whole foundation of western based mathematics. Books, articles, lectures, dvds and powerpoint presentations will follow to finally set the record straight so we can advance humanity and shake off the shackles that bind the populations. Thus, consider that 3.141592…. an approximation to π, is really the perimeter of the inscribed polygon with 192 sides and above. The circle is the limit for the inscribed polygon. In this light, we can dub Old Pi as Traditional Pi or Legacy Pi or Disharmonic Pi or Deficient Pi, to distinguish it from the New Frequency, the True Value of Pi that we are just about to Experience. The difference between the 2,200 year old Archimedean method and the proposed method called JainPi is simple. Archimedes has adopted the Polygon–Circle system. The newly proposed method involves a highly intelligent and sophisticated Root 5 Circle-Square system. 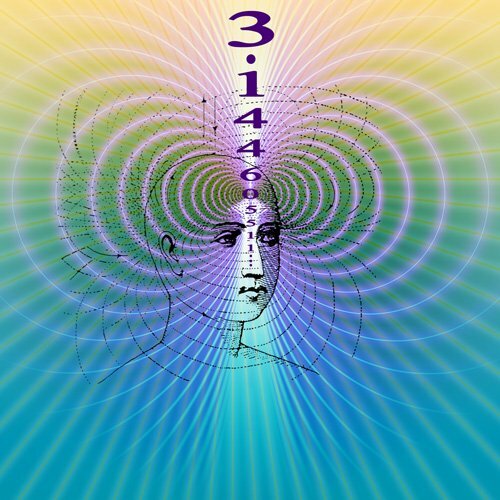 3.141592… is a good logical approximation, but 3.144… is an accurate approximation: (JainPi = Jπ = 4÷√ϕ = 3.144… or 4 divided by the square root of Phi). Notice how the first 4 digits “3144” repeat at the 15 dp. as a Pin Number for the Universe. (This is similar to the value of Pi used by NASA which is higher than the traditional value of Pi. Sources of information claim that NASA are secretly using another Time System based not on 24 hours in a day, but on 27 hours + another value of Pi which is higher in the range of 3.142 to 3.145… The rumour goes that the mooncraft would have missed their targetted site by 20 kms had they used the false and traditional value of Pi as 3.141592, so to make the correction necessary for the mooncraft to land successfully on their target (if it ever really happened!) NASA were forced to increase the value of Pi). Language has been a barrier….this ‘path’ geometry takes to open dimensions into mind can be read naturally, instinctively. Geometry is dimensional gating. The center of this text box shows patterns whereas, if I were I to speak geometrically, it would become an optical illusion on top of the standard. Wanting to start my mind at an emotional turning point, add these principals and see for the 1st time in ages. Hi Zaza, let me know more about what topics you are interested in. Do you have a facebook profile so I can know more about you. Need also your full name and country.